Are you looking for organic almond butter? Once you taste the rich, slightly sweet taste of almond butter, you’re hooked. Easy to spread on a cracker or a banana or thinned to use as a base for a soup or sauce, organic almond butter is an incredibly popular and versatile alternative to that other nut butter you can easily find on every grocery shelf. Now, peanut butter’s great, but almond butter is unique. Not only is it packed with flavor but the nutritional content is a cut above your average nut butter. So where can you find organic almond butter? Well, unlike peanut butter, which can be found in just about any food store, organic almond butter is a little more difficult to find. A few grocery store chains carry conventional, mass-produced almond butter. You’re best bet for high quality, organic almond butter is online retailers or organic specialty food shops, although some Meijer stores in MI carry Naturally Nutty products. When you're comparing brands of organic almond butters, read the ingredients on the label carefully. Many brands contain added salts, oils and other fillers. And, remember that almond butter made in small batches retains more nutrition than almond butter that's mass-produced. Another factor to consider when choosing organic almond butter is the consistency of the mixture. Our Naturally Nutty organic almond butter has a creamy, home-style texture that stirs easily with a spoon. If a jar of almond butter has a thick layer of oil sitting on the top, chances are that mixture will be pasty and dry, not to mention very difficult to serve. Finding the brand that tickles your taste buds with its flavor and texture can be an adventure. Why are people choosing organic almond butter? Well, it's not only delicious; it's good for your health too. When you choose organic almond butter, you can be sure that no synthetic pesticides, herbicides or fungicides are lurking around inside your food. You can spread it on your toast, use it for a sauce in a stir-fry or just eat it off the spoon knowing that you’re eating well. Compared to peanut butter, each serving of organic almond butter provides more protein, more fiber, more heart healthy nutrients (vitamin E, calcium, magnesium and potassium) and no cholesterol. Plus, almond butter is abundant in monounsaturated fats, which support heart health. 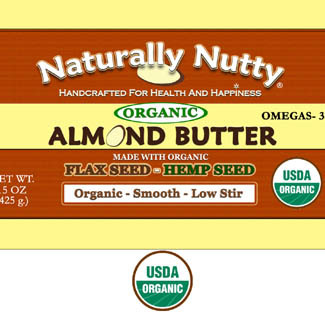 So if you're shopping online for organic almond butter, give Naturally Nutty a try. Each batch of our almond butter is handcrafted using our own unique recipes in small, carefully monitored batches. We even add extra organic flax and hemp seeds for even better nutritional value. Give us a try. We think your family will enjoy these delicious and nutritious nut butters as much as we do!